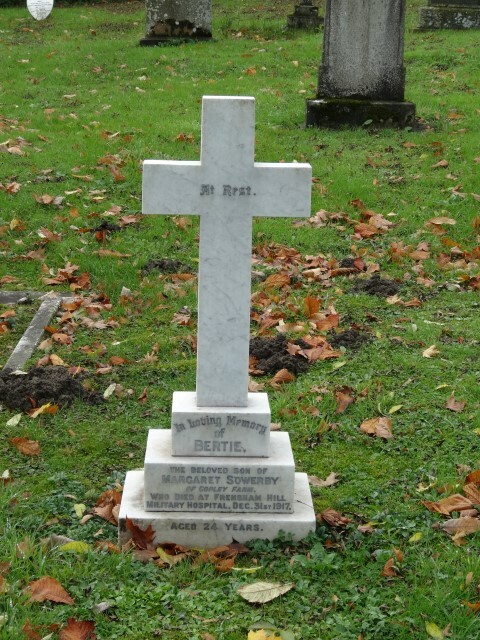 346005 Private Bertie Sowerby, 215th Divisional Employment Company, Labour Corps died 31 December 1917 and is buried in Lynesack (St. John) Churchyard. He was 24 years old and is commemorated on Copley War Memorial and the Memorial Plaque in St. John the Evangelist Church, Lynesack. Bertie Sowerby was born 1893 at Staindrop the son of Margaret Sowerby. In 1901, 7 year old Bertie lived with his uncle and aunt, Francis and Mary Sowerby at Stainton Lane, Marwood near Barnard Castle. Francis was a “hind” working on a farm. Francis was Margaret’s younger brother and in 1891, the Sowerby family lived at Old Lodge in the Parish of Raby & Keverston near Staindrop. This may have been one of the tied cottages associated with the Raby Estate of Lord Barnard. Margaret worked as a dressmaker. By 1911, 17 year old Bertie lived with his mother and Mark Chapman, a 47 year old farmer working Copley Farm near Butterknowle. Bertie was employed as a “farmer”. Bertie Sowerby enlisted at Seaham into the Durham Light Infantry and was allocated the regimental number 32094. He was later transferred to the Labour Corps, number 346005 serving with the 215th Divisional Employment Company. The service records of Private B. Sowerby have not been traced and the circumstances of his death are unknown. 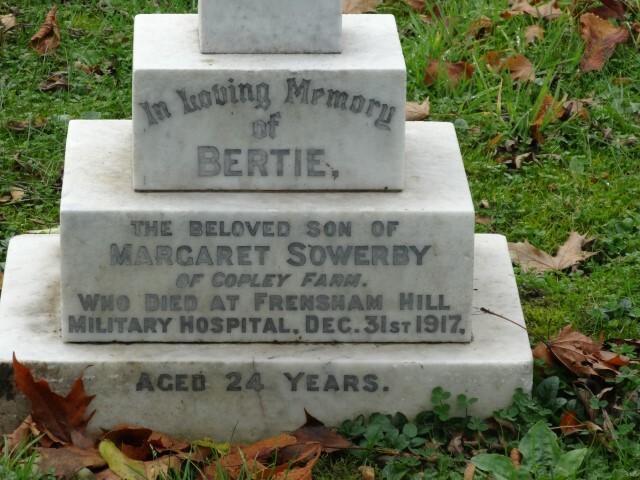 31 December 1917: Private B. Sowerby died at Frensham Hill Military Hospital, Farnham, Surrey aged 24. 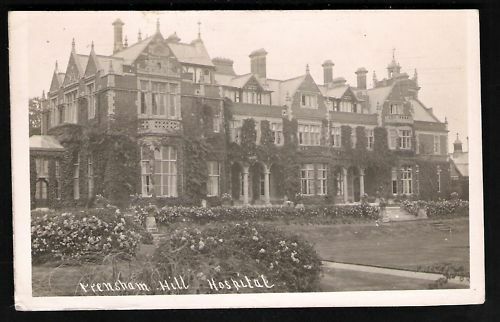 Frensham Hill was built in 1902 for the Charrington brewing family and during WW1 was used as a military hospital then in the 1920’s converted to a school, now known as Frensham Heights School. Private B. Sowerby was awarded the British War and Victory medals. 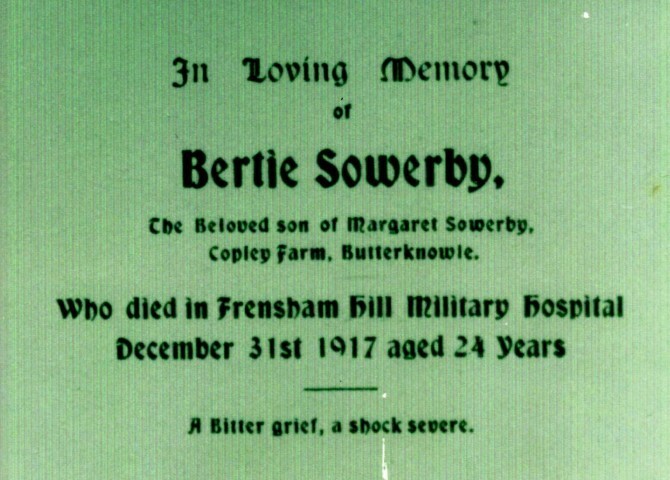 346005 Private Bertie Sowerby is buried at grave reference 611, Lynesack (St. John) Churchyard.